Kanhaiya Kumar, President of Students\' Union, Jawaharlal Nehru University, withdrew his fast as the indefinite hunger strike by JNU students entered the 10th day. Kumar called off the fast due to medical reasons. Kanhaiya was discharged from AIIMS, on Friday after receiving treatment for mild dehydration and ketosis. Though six students including Kanhaiya have withdrawn their fasts, 14 others are still on hunger strike and will be joined by JNU Teachers Association for a relay hunger strike, today.The protest in JNU is in connection with the 9 Feburary event during which \'anti-national\' slogans were raised. "Kanhaiya was back on campus last night and due to his health condition doctors advised him to discontinue the fast. He has been advised bed rest for few days and also has to undergo some medical tests. While he has withdrawn the fast, he will continue with the agitation," a statement from the JNU Students Union said.Yesterday, the JNU administration had appealed to students and teachers to not invite outsiders as it would mean compromising on campus safety and security. 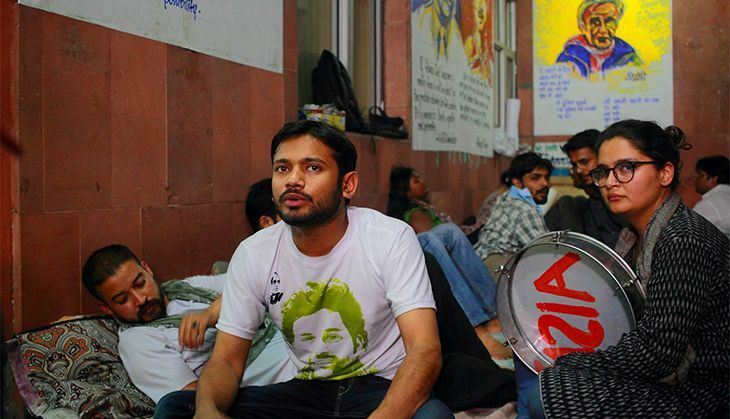 Earlier, the hunger strike was termed as "unlawful activity" by the JNU VC, Jagadesh Kumar. READ NEXT >> Adele calls Beyonce Knowles 'Jesus f*cking Christ'. This is how Twitter reacted!